Purification of your sacred space is not always needed. If the ritualis to be performed outdoors, in a wild area, it is unlikely it will be needed.Outdoor rituals only need to have the space cleansed when the area in question sees frequent use by people. It is when performing rituals indoors that we should remember to cleanse the area. Unless your magickal space is used exclusively for that purpose, which most of us simply do not have the space for, thenpockets of 'negative' energy will have built up from our daily lives. Sort of like an oily film that needs to be washed away. To cleanse the space first you should make sure you will not be interupted from now until when you are done the ritual. That means lock the doors, take the phone off the hook, shut the curtains, tell roommates and family that are not participating to stay out of the room, you are not to be disturbed. If necessary work your magick when all others are asleep. First, physically clean he area as much as possible. Use a broom, vacuum, or mop, or even just pick up any litter, but the space should be as clean as possible. Next, psychically clean the space. Removing all negativity. There are many different ways to do this. 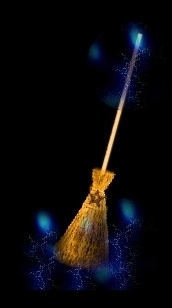 If you have a magickal broom sweep the area with it, visualizing the negative energies being swept from the area. Note the bristles of the broom need not touch the ground for this. If you do not have a brrom you can sweep with your projecting hand. Perhaps you would wish instead to 'fumigate' the ritual space with a purifying incense. Good incenses to use would be alkanet, angelica, asafoetida (not recommended, the odor is strong enough to cause nausea), avens, basil, bay, benzoin, betony, cedar, clove, copal, cumin, dragon's blood, fern, frankincense, fumitory, heliotrope, juniper, mistletoe, myrrh, pine needles, rosemary, sage, sagebrush, sandalwood, thyme, tobacco, or vervain. Many stores carry sage smudge sticks that are made for just this practice. You could scatter herbs or prepare an herbal wash.
Good herbs for this are angelica, anise, arbutus, avens, basil, bay, boneset, broom, chamomile, cumin, dragon's blood, elder, horseradish (dried), hyssop, iris, lemon juice (why do you think so many cleaners are lemon scented), lemon verbana, lilac, loosestrife, mimosa, mint, mistletoe, nettle, peony, pepper, peppermint, pine needles, sagebrush, salt, solomon's seal, tamarisk, thyme, turmeric, vervain, or yarrow. I like to do a combination of these, sweeping the area either with a stick of rosemary or frankincense incense, or a sage smudge stick; driving awaythe negativity with both my own energies and those of the incense.